ways we find out if followers enjoy what we post is the good ol’ “like” on Facebook. It’s a magical button. It brings joy and makes the sky seem brighter and really makes kittens happy. Ok, I kid. In all seriousness, we do measure likes. Facebook has stats for us to see just how many we have over a period of time. However, it’s a very deceiving stat because there are brands and organizations that will, flat out, ask for likes. It’s a weak strategy because it doesn’t really measure the effectiveness of what you are doing. Here are two cases where, I believe, this is a bad move. 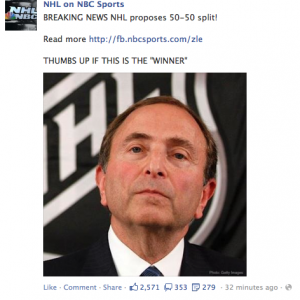 When I screen grabbed this Facebook post by the NHL on NBC Sports, they had over 2500 likes. But what does this prove? Can you effectively say that your social strategy works? You’ve asked people to like something if they believe it’s a “winner.” Personally, I would not recommend this as a social media strategy. 1) Your strategy should involve talking to your followers, not insulting their intelligence. 2) You don’t need to beg or ask for anything. Your followers want to like you. Show them the love. 3) Do not post like a pre-teen. Just because others do, does not mean it’s effective. Agree or disagree? Let me know. I’d love your thoughts.